knowledge, you will be more valuable to our fish and our sports fishery. I highly encourage your attendance! Some of my favorite speakers will be there!!! I can't wait! Not only that, but there will be some really cool prizes, and kids events, also! If there were two people I had to choose to spend a day with, it would have to be my kids, Andrew and David. Yesterday, we got up at O' dark thirty, to go to my sister's church in Lake Oswego, River's West. We had to be there by 8:00 to have breakfast at Miller's, then onto church by 9:00 AM. Andrew and David spend much of their time, it seems, listening to comedy. They mimic it well. Besides that, they own their own sense of humor that affects me beyond anything that I can endure with a straight face. It was a challenge to keep my vehicle on a straight path! Several times during the drive, I was tempted to pull over, due to the tears in my eyes from laughing. No one in this world can induce me to serious guffaws and uncontrollable giggles like David and Andrew! I mean, snorting, bent over double laughter! How do you drive... like that? I can't!!! Let me tell you of the terrible feeling when I was a child, of sitting in a hard pew at church in a quiet, stifling, and antiseptic environment.. The delight, and the extreme terror of trying to stifle those oncoming giggles! That was all brought home to me yesterday, thanks to those little "naughty" angels! It didn't stop at church, either. All day, as we traveled to my sister's home to celebrate my nieces graduation from beauty school, to getting their hair cut, to eating at Quizno's. It was a solid, non stop, gut ache from laughing. Have you ever snorted a sub sandwich? It's not pleasant, but at the same time, I couldn't stop laughing! If laughter is the best medicine, folks, I am overdosed! What a great day! Allison, (with her new beauty license), went to work on us. Andrew got his long locks cut very short! I love it! He looks human again! David got his hair cut, also, and we all look clean and shiny and new! We got to meet Allison's boyfriend, Sergio, who just returned from Iraq. He was in the 101st airborne. I can't imagine the terror he has experienced, and I thanked him for his service to us. I was so tired on the way home, but fear not! Andrew kept me awake and in stitches, while David slept in the back. While passing a car, pulled over by the police, Andrew noticed it appeared the guy's car was being searched. Audible to me, yet probably not (I hope!) to the men involved, Andrew unrolled his window and yelled, "I see you are busy! Let's meet for the deal later!" That boy is going to get me into trouble! :"How Great Thou Art!" If you were to look outside my window, at this very moment, friends, you would see that to be a bold understatement. Click here to find out who won the awesome trip with Eric Linde! I've always had this theory that if after three casts in a spot on the river, I don't hook up, there aren't any easy fish there. I move on. I am always curious to see if there is one over there, instead of here. Down here, instead of up there. Yesterday was such a beautiful, lazy day, that I cast several times, sort of in a trance. The sun was warm on my shoulders, the water was low and clear. It was the first time I had fished without a jacket in ages. I just knew there weren't fish there, but I cast... and cast... and cast.... Kilchis played by my side. The cat, Molly, jumped from hole to hole on the beach, waded to her tummy in the still pools that formed on the beach. She was searching for anything alive, to play with. She found nothing. It's too early for fry to gather, there. Failing, she finally stretched out on the warm sand, for a nap. My corky teased her, as it danced above her head, and then flew across the river. I was almost ready to join her, when all of the sudden, my "no easy fish" theory dissolved into a flurry of activity! Something mighty and powerful shook, and pulled, and came alive at the tip of my rod! I could see the entire structure of the bottom of the river! Where oh where had he been hiding? I was using 10 pound mono, a light lead and a very small corky with a "Gulp" worm threaded on the hook. Guess what? Steelies like "Gulp!" I had tried it before, but never had any luck. This time, it worked! I use this kind of thing when I'm too lazy to go get shrimp. It worked! It worked! Anyhow, I brought in a beautiful wild steelhead buck. His sides glared at me like a mirror in the sun. There was no rose hue on this guy's gills. He was as chrome as a nickel and as fresh as they get. 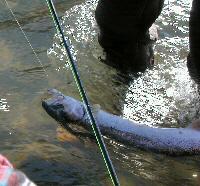 He was easily released, and it was only then, that I set my rod down, and joined Molly on the soft riverfront sand. Both of us, sprawled out and purring, grinning from ear to ear like cheshire cats. Be sure to enter our new contest with Johnny Bowles! I've often noticed many boats on Tillamook Bay following him around. Why? He catches fish! Follow him! I used to take long, hot baths at night to relax, almost every night. My bath tub is huge, and it takes up a lot of hot water and a lot of electricity, too! Let me tell you how I have saved money, lately. I bought yet another pair of exotherms from USIA. They are rose colored, and beautiful. They are called "exolites" and are they ever pretty! There is no more waiting for the tub to fill. There is no more freezing, as I get out of that wonderful tub of hot water. There are no more electricity bills that have me passing out, in fear, at the mail box. Every evening, when I feel those "tired and cold" exhausted feelings, I simply walk upstairs, open my closet door, and climb into my new "exolites." As I zip them up, I know my day is done. Instantly, the chills are gone, and I feel so warm and snuggly! It's like being wrapped in the most wonderful, cozy cocoon! Next, I lay on the bed, (no covers needed) grab a book, and enjoy! I have heard from other 'Exotherm' women that the men in their lives are feeling slighted and distanced. There is no need for snuggling at night, anymore! We simply don't need you for that! We are warm and snuggled and hugged, all by ourselves! Sorry! Thank God I have a built in body mechanism that tells me when to slow down. When I over extend myself, I simply get sick. It's a good thing, though, because no matter how many times someone tells me that I am overdoing it, I don't listen. Even if I know it, myself, I can't make myself rest. For me, it's go, go, go, collapse! So, two days ago, I woke up feeling really bad. Fever, chills, aches... yes. I overdid it. I had no choice but to lay in bed most of the day. Since I was there, I found it a great opportunity to put on my exotherms. Yesterday, I thought I was better, so I showered, put on real clothes and came downstairs. Nope. Don't feel better. Back upstairs for my exotherms! I think there is something wrong in this world, if you have to be sick or tired to wear exotherms. I see no reason not to live in them, day in, day out. I mean, hey! I can get up in the morning, simply pull on my waders, and go fishing! I'm ready, right out of the box! Come in, take a shower, (for cleansing only, mind you!) put on my exotherms again, and I'm dressed for the day! (They come in all kinds of pretty colors, now!) Come inside, and there is no need for a fire! I'm already warm! Finish my day, no need for a bath! I'm warm! Get ready for bed, no need for pajamas or covers! I'm there!! You can buy lipstick to match your exotherm color of the day, and you can wear earrings/jewelry to dress them up! Who says exotherms can't be vogue? I was laying in bed, last night, staring at Kilchis. What a life! He'd played all day on the river, came in, ate dinner, and passed out at the foot of my bed. Kilchis needs no blanket, no soothing bath, and no fire. You know what? Neither do I! I have several new colors of fur coats, and you can't take them away from me! It's a dog's life, living on the river in exotherms, and I'm liking it. O.K. I'm having a flip side mood. I should have known. I've been on cloud 9 for a while, and now it's time for a bit of rain. I've been working on ifish more than normal, and I'm tired, and I have a cold. But, that's not what has got me down. What has got me down is this I am falling behind in my responsibility in supporting our fisheries. I am adding important links to pages. I am trying to make sure important topics get pinned to the top of the boards. I can write to legislatures myself. I can urge you to participate. However, I simply cannot do it as much as I used to, when ifish wasn't so busy. So, this leads me to wonder if it is all worth it. We have crowds as ifish. Oh! Do we have crowds! We all love to fish! Why can't it be that we all work together to save them? Can you imagine the power, and the leverage we would have, all together? Why do we get side tracked into petty arguments? "I'm right" and "He's wrong" happens on so many topics. Or, of all things, people complaining about the length or stupidity of a "word association" thread, and whether or not it should have a place, on ifish? It frustrates me, at times, and it hit home last night, big time. Why do I do it? It's not because I like to run a chat line. I run ifish because I love to fish. I love the streams and the rivers, and the ocean. The love and respect I feel for our natural world is to be taught to our children, and preserved for them. That is our job. It is our responsibility. I feel like I've been given ifish for a reason. It was a gift. With all gifts come the responsibility to use them in a positive manner, to share it, and accomplish good. When I started ifish, it was a hobby. Now, I joke about it being a jobby. But, it is. I need to step back and re evaluate things. Take some time to reflect on how we can better help ourselves accomplish what needs to be done, as a group. I keep thinking we need to form a team or something, to be more organized. A group of cheerleaders, so to speak. It's no help to talk to Bill. He attended meetings for years, tried to rally the troupes, and in the end, pretty much gave in. He says, "It's always the same few." Why is it that sports fishermen and women cannot seem to unite? Is that really true, and is there really no hope? My pie in the sky dreams help me to doubt that. Never say never! If you have any ideas that will help, let us know. We all have the passion for fish. Now we just have to keep the fish, so that our passions have a place. I am pickled as punch to see our first hummingbird this year. Spring has sprung. It's not Groundhog's day around here that announces spring. It's the annual steelhead fishing out back in a tee shirt. It's the first hummingbird sighting. It's the disappearance of the junco. (They aren't gone, yet!) 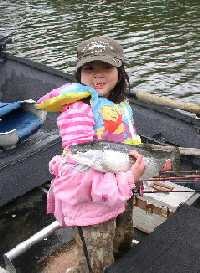 It's dreams of spring chinook, and lake trout fishing. However, it certainly isn't the mountain quail that is living in our back yard! What the heck is he doing here? Don't get me wrong. I get a big kick out of watching him! Especially when he gets spooked, gawks his neck out, and runs to the bushes like a roadrunner! Mountain quail normally are in groups called a covey. Mountain quail usually live in the coastal mountain ranges. Not our mountain quail! He is content to live in the meadow here, happily munching corn and sunflower seeds, next to our resident wild rabbits and our one lone thrush that hasn't left us for the spring, yet. What a hoot! Do you have your own mountain quail? I'm still sick, somehow. It's the weirdest sick I've ever been. No real cold symptoms, just achy, a bit of a fever, and so, so tired! I think I feel better, so I go out back and cast a couple times. I may do a little ifish work, then I crawl back to bed, and think I can't move another muscle. I've been downing vitamins and supplements, but nothing helps. I've got to get better! We have had such good escapement this year, on the river. The water levels have always been perfect for the fish to make fast, deliberate runs, upstream. We all know what that means. It means that you have to be darn lucky to hook into either a salmon or a steelhead! There is no low water for them to pool up and rest. You can figure this as good news, or bad. Good news for the fish. Bad news for the fishermen and women. Or is it? Maybe this year I haven't caught as many, but just think of the return, if all of the other conditions are favorable! Go figure. The year that the escapement is excellent, we also had the Kilchis slide. Then... we have to consider the ocean conditions to come, and the chance of late spring floods... what a complicated process this all becomes! The fact remains, however, that spring has sprung. I'm still casting for late winter natives in tee shirts, and life is good. It's my favorite time of year, you know. That is, besides all my other favorite times of year! Bizarre. Not much for miracle drugs, but I found one! I felt really bad yesterday, and went to the doc. The doc said, "virus." If there isn't a more frustrating illness! There is nothing to do for viruses. No pills, no antibiotics, no quick fixes.. except one! "Olive Leaf!" I believe! I always pound down something called, "Wellness Formula" when I am sick, but this time, it didn't help. I had some Olive Leaf herbs from when I was sick a year ago. I never tried them, but the gal at the health food store said they help. Well, I took two yesterday afternoon, and man! I felt better! Whooo hooo! Took two more last night, and two this morning! I feel almost normal! The stuff rocks! Now, I can get things done! Now, I am a person again! It feels SO good to not feel like you've been hit by a truck! Thank God for illness. Without it, I wouldn't appreciate how wonderful it is to be well! In two days, it is the birthday of not only Bill Hedlund, but Marty Peterson, and Joe Schwab, too! Talk about a fishy day! All three guides, or ex guides, on the same day. Not only that, but Joe and Bill were born in the same year! Fishy! Speaking of Marty, man-oh-man did we have a great time, yesterday! I made Marty an awesome chocolate cake for his birthday, and he kept saying, "Just one more fish before we eat cake." Argh! How many fish do we need? I need cake! We had a blast, caught lots of steel, and came home very, very satisfied. I have a new attitude! Thanks, Marty! Now, I have to bake Bill his favorite applesauce spice cake. Wonder what kind Joe wants? Here are a couple pics from our fishing day, yesterday. All reeled and ready to go! This fish took both baits! I am just swamped today. We closed ifish last night, to discussion, while we did maintenance, and I rested. It was lovely! Today, I have quite a list to get done. Both on ifish, and shopping/baking for Bill's Birthday. You know what simple pleasure made me very happy yesterday? When I got home, I got out our lawn furniture for spring. Nice chaise lounges, and chairs. :) It's a grand trade off. Down come the chairs out of the shed, and it makes a perfect place for the duck decoys, taken from the duck lake. The seasonal shelf trade. I loved it. Now, with all I have to do, I'm going to grab a cup of coffee, and go sit outside in the morning sunshine for a while. I'm going to take several deep breaths, and take in a bit of the beautiful day. We all need to do that. Come with me! If there were ever a place I've lived and related it to smell, it was my little house on the beach. In my earliest days of marriage, I lived first at Gleneden Beach, and then, on the Salmon River. Those days are long imprinted in my mind by smells that were associated with our lives, there. It was at Gleneden that I learned the true meaning of long days, with little to do. We had very little money. Likewise, we had little to worry about. (I still believe that to be true!) My husband and I would spend entire days down on the beach, searching for agates. Sometimes, we would wander miles on the beach, all traveled in silence, head down, on our knees. It was only occasionally we would break the silence and shout out, "Wow! Look at this one!" Our pockets grew heavier as the day wore on. Sometimes the fog would get so heavy that we could not see each other. The smell of the ocean, remains with me. Often, one of us would leave the beach early, to go to the house, and make breakfast. I'll never forget being the one to come up the hill last, being met, clear at the end of the road, with the wonderful smell of bacon on the stove! The smell of bacon cooking still brings back those memories, today. It was also then, that I learned the true meaning of dog stench. My dog at the time, Hershey, (God rest his soul) had a wonderful time wandering down to the ocean beaches of Gleneden to scavenge dead fish carcasses. Bottle after bottle of tomato juice was purchased, as we searched for a way to make him clean again. You can imagine this dog's delight, when we moved to a small home, overlooking the salmon river! During the spawning season, Hershey would drag up totally unidentifiable and ageless species of salmon into our yard. He would eat them, roll in them, and then innocently attempt to crawl into bed with us. Many nights I remember sleeping peacefully, listening to the rolling of the river, only to awaken to the most obnoxious smell that I have ever experienced. Both my husband and I would let out pitiful moans in the middle of the night. "He's done it, again!" If it wasn't the smell, it was the sound of Hershey's intestines. He had grown past terrible bouts of salmon poisoning, and onto pure digestive distress. His intestines would sing in the night so loudly that it would wake us, both. Somehow, through endless baths, through sleepless nights, I can still laugh at the memories. It was with total exhaustion, that last night I rose from the computer, and headed for bed. Kilchis was out in the night with Dee Dee, chasing and barking at imaginary creatures along the river bank. David was upstairs laying on the bed with me, telling me tales of the Tillamook High School tournament that he has been attending. We heard Kilchis come up the stairs. All of the sudden, I went silent. Gleneden came back to me. The Salmon river came to me. All the memories of beaches, and agates, and (ach!) cooking bacon, and long walks on the ocean beach washed over me! Kilchis stunk to high heaven! After two years of living here, I thought he wasn't a roller. My luck dissolved as the room filled with stench. His shoulder was a familiar mass of rotting salmon carcass! A partial rotting dorsal fin, half stuck to his collar and hanging from his fur. Kilchis wagged his tail and grinned at me as if to say that he had discovered the most wonderful discovery and wasn't I proud of him? "KILCHIS!" I yelled in disappointment and agony. I have never seen a family react more strongly, or run for opposite rooms more expediently. The word "evacuate" comes to mind. If you've yet to smell this smell, you are graced. David had gone. Bill had gone. I heard Andrew shut his bedroom door to the wafting fumes, and yell, "Where is the Febreeze?!?!" It Kilchis and I, alone with the offensive odor. He looked up at me, wagged his tail and laughed. Now, Kilchis lives on the river, and loves to swim. He has never had a bath. He bathes daily in the river, all by himself. Last night Kilchis and I headed for the bathroom. The one with the shower doors on the tub. I was NOT pleased. I washed a very shocked, and unwilling, long haired dog. He was not happy. But then again, neither was I.
I'm so afraid that this will become a pattern, now. It was awful, and even after a bath, the lingering odor remains. Looking back at my life along Gleneden beach and the salmon river, I remember the smells, my dog, all of the memories, and chuckle. They were good times. Over the years, the sadness of my marriage breaking up has softened, and the memories instead, bring a smile to my face. However, I'm not yet able to the smile or chuckle about last night. As I wander around the house, I sniff for any remaining smells in the house or on Kilchis, and think, or well, I hope! "This too, shall pass." Before I go to bed at night, I head over to the window, where I have a rechargeable spot light. I shine it over the meadow, and into the trees. I often see deer, elk, bobcat, racoon, and who knows what kind of eyes, glowing in the night. It's a wild, wild, world out there! Most mornings I get up, pad downstairs across the cold kitchen floor, get the dogs a cookie, and let them out. Waggly tails brush my bare legs, as they rush to go chase those critters of the night! I then follow my nose to the coffee maker, and stumble straight to my computer to see what has happened in the equally wild world of ifish, as I slept. My cat Jack, is usually curled up at my feet, and I pet him with my stocking feet, as I work. I consumed an entire cup of coffee, before I began clearing the fog in my head. Wait a minute. In between e mails, I reached over to pet Jack, who was.... on my table? It was then that I realized Jack was... on my table! It was then that I realized I was petting "WHAT!" with my toes? My foot froze. Then, it began searching. It was large, like a cat. It was furry and soft like a cat. Was it Molly the cat? I poked it, with my big toe. I was afraid to look. It did not move. I traced the body shape, with my entire foot. It did not move. It was big. Oh yes, it was big. Finally, mustering all of my courage, and holding my stomach, I shoved my keyboard in, retracted my foot and took a look. Now, let me tell you. I laughed at "the bunny of doom" that I posted on ifish. 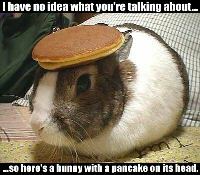 Bunnies with pancakes on their head are funny. However, the dead bunny at my feet had no pancake. In fact, this bunny had no head! At my feet, sprawled out on his side, was a beautiful wild rabbit body, that just yesterday, I had watched with my binoculars, out in the meadow. Yesterday, the bunny had a head. How on EARTH could a cat kill a bunny this big? He was almost Jack's size! I screamed for Bill. I screamed loud. "Bill! There is a headless bunny in here!" Bill sadly extracted the bunny rug from my foot quarters, while scolding Jack. It's a wild world out there, in the woods. But, I guess there is one less bunny to worry about. I will tell you this. No longer will I be petting furry animals with my feet without checking first. Excuse me, but I'm feeling nauseous. ...second morning of the day! I have gotten so many, many letters asking if I am still OK. Yes! I am! I have just been busy with the new board software. Tonight is the night for the move. I have been enjoying two mornings a day, as of late. I get up at 5, do a little ifish work, and by noon I'm tired, so... I go back to bed, and get up at three, make another pot of coffee, and do it all over again! It's been SO nice, because I am able to thoroughly enjoy my evenings, and not be so incredibly tired. Last night, David had a band concert, and I really enjoyed it! Usually, I have to rush through dinner, tired, and then drag myself to evening events. Not last night! I was a real person! I smiled! I soaked up the music and enjoyed!! At 6:00 PM, the board will go down, while I work on opening the new board. I can't give you an open time, but I hope that the process is expedient. I will know when I get there. Lots to learn on both sides, user, and admin. I don't know if I'm looking forward to doing it, or having it done, more! All I know, is that I'm extremely anxious to get on with "Jennie's Fishing Life" and past "Jennie's computer life!" Might as well write, whilst I wait. I'm waiting for the CGI info to be imported into the MySQL database, so that we can run Threads. Other than the fact that I honestly prayed for tons of endurance while I lay in bed at 3:00 AM, trying to get to sleep, I have no idea why I still have energy. Wait. I think I just answered my own curiosity. There is nothing more incredible than peanut butter cookies and milk. Wait! Disney World is close! Different, but the same feeling of wonder comes over me. Yes, I stayed up really late last night to work on Threads, the new discussion forum. It was hectic and tiring, but... it was kind of nice in the house! Not a soul awake! Quiet, peace....just Kilchis and I! The wind began to stir about 1:00 AM, and I whispered to Kilchis... "It was a dark, and stormy night..."
He cocked one ear, and fell fast asleep again, at my feet. Got up at 5:30 this morning, and even though there were tons of problems, I was excited! THE BOARD STILL WORKS! ... or does it? It wasn't long before I realized there were major problems in the special script they wrote for ifish. The member stats were not matched up in the data base. Well, they were, for the most part, but random cases were not. Thus, member A had member B's address, and Member C logged on and had member D's user name! It could have been rather comedic, if it hadn't been MY ifish, but since it were, it weren't! Not funny, at all! Thank God for the incredible patience and support that this big ifish family has given me! I am beginning to see the light at the end of the tunnel! 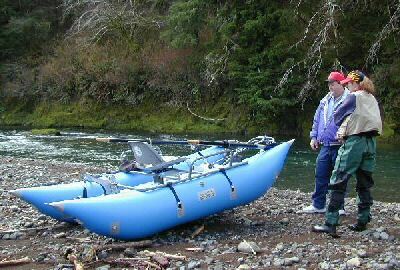 Many, many long days on the Columbia, the Willamette, and Tillamook Bay! YES! I'm almost there, Threads, baby, and lookout! When it's settled, I'll be on the river, again! It's been way to far and few between, lately! I think I'm new, again! Although I have a little relapse of whatever cold/flu I had, I'm feeling totally relieved that the move is over. It wasn't easy! In fact, it was the hardest thing I have done on ifish, yet. Some things don't come easy for me, and this was one! I'll never forget the feeling of total exasperation, when the guy I hired, decided to do the final import after I had gone to bed. I got up to check my e mail, while getting a drink of water, and he said he was doing the final import! WHA? This, after the import before hadn't worked, and I had had 3 hours of sleep in 48 or more hours! I was toast! Never, had I been so exhausted. As I read that e mail, and realized he was doing it, (and had forgotten to close down the Classic board while he was doing it,) I just sat there in my pajamas, at 10:00 PM at night, and sobbed. I ran upstairs, got out of my pajamas, and started to work. After about 30 minutes into it, I gave up. My eyes hurt, and watered. My body screamed. My brain failed. I gave up. This meant that the posts on the old board, from the time that he began the import, would not be transferred into real time, into the new. I knew that. But, my body, exhausted from a month long fiasco with this board transfer, refused to cooperate. Ifish would just have to lose posts. It was the first time I have ever allowed any type of failure. We lost 24 hours of posts. I went to bed. Five hours later, I got up again, and began to work on the board. Five hours of writing permissions on groups, setting headers and footers, making sure that people saw what I thought they should see, I opened our new Threads board. I had been warned that users would complain for the first two weeks, until they got used to it. I prepared myself for that, and was pleasantly surprised that most everyone loves it! I have had a handful of problems, at best. I'm recovering. I'm happy. The board is happy. Now, as we are all learning the new software, I look forward to starting my spring chinook season! No longer is the light in the tunnel 198 miles due West. I can see it, right in front of my face! The warmth feels good on my body. Yesterday, I took most of the day off. I did things I hadn't done in ages. I mean... lots of ages! Three weeks ago, I was asked to play for a wedding. Now, mind you, I haven't touched the piano keyboard in 6 months. Last week, I realized that the Mother of the bride had not given me the music, yet. I phoned to ask her for it, and I received the music, three days before the wedding. Get this! The processional was an Aria, she said over the phone. Great! I spent how many years, playing for an opera singer? I can do Arias. Come to find out, it wasn't as expected. No Puccini here... As a sign of the times, the music book I received was titled "Final Fantasy!" It was an "aria" from a computer game! It was simple. I did not study it. Yesterday was the day of the wedding. I took a shower, trimmed my nails for playing, for the first times in ages. Downstairs, I sat at the keyboard. I had unusual confidence, and I was wondering if I would be disappointed. I was not. She wanted Fur Elise, and maybe a Beethoven Sonata with her computer game music. I started with the Beethoven, still memorized from my teen years. It came out flawlessly! Beautiful! I was encouraged! Then, Fur Elise.. a simple and melodic tune that filled the spring air. I can play! I didn't stop there! Debussy! Chopin! A little Milaud! Off to the wedding. I played at the wedding on a full grand Yamaha, and I was lost in my own music. Often times, while playing, I get lost. It is like it is not me. I'll stop, glance at my fingers and wonder how they do that. I am playing, but I am also, somehow sitting in the audience. I am beside myself, listening. I am gifted. I can say that without being boastful or full of ego, because I did nothing to earn this gift. My Heavenly Father gave me this gift. Along with whatever we are gifted with, comes great responsibility to share, and to use them in a way that glorifies God, and touches other people. I have been selfish with my gift of music for the last year, and I need to find an outlet to begin to play, again. After the wedding, two women came up to me in tears, and told me how beautiful my music was. I knew it had been, and I almost said, "Yeah! I know!" I didn't. But, I was truly touched by the music that God had given me that morning, also. There are times when I have played in the past, and have not let it come out, spiritually. I try too hard, get all bundled up with nerves, scrunch my shoulders in pain before a difficult passage, and make things more difficult than they have to be. I wonder where God was, when Schubert wrote some of his arias, where repetitive octaves absolutely kill my wrist. Talk about carpal tunnel! Try being a rehearsal accompanist for someone who wants to sing Schubert! --or try a little "Parigi, o cara, noi lasceremo" from Traviata! It is when I perform these things, that I wonder if God is around at all! I can't play those things and "let God" right now. Without practice, I'm on my own, baby! If I can let go, and let God, my music comes from heaven. I truly believe that, and I truly believe that the music that comes from me, can be effortless, if I am well studied, and therefore, have the ability to relax, and channel it through Him, and not through me. If I don't practice for a day, I can tell. If I don't practice for a week, my family can tell, and if I don't practice for a month, everyone can tell!! But, since no one there had ever heard me play, and I totally relaxed, and let God take over, I pulled the wedding off beautifully, and it encouraged me to start on the piano, once again. I'll tell you one thing that I know for sure. I was NOT gifted in computer coding, and I have no desire to be. Sometimes I think Ifish was a gag gift to me, and God is upstairs rolling on the floor, in laughter. He does have a sense of humor, you know. I'm so thankful that the stats show that most everyone is on board, at the new ifish board, and doing well. I have received but one e mail that stated anything but total satisfaction. YAY! I'm sure there are a few people struggling that I haven't heard from yet, but I have found it really easy to help those that are having trouble. It's usually just a minor tweak, and they say, "DOH!" I've spent many hours, of late, at the help desk. If you need help, I'm more than glad to spend some time with you. Just click here, tell me exactly what you are doing, and what error you are getting, and I will be glad to assist! The Kilchis river, behind my home, is my constant retreat. A place for reflection, for rebuilding energy. The song of the stream heals and renews me, and provides me a place to be with my best friends, Molly, Dee Dee, Kilchis. Being there inspires a song in me. On the river, the point is to spread happiness and communication. Sometimes, I sing at the top of my lungs, and most often, I care not what notes they are, or whether they are pure tones. I don't even imagine there is anyone listening. (Please tell me it's so!) It's almost more fun to try to sing off tone. You know, like the Quizno sub guy! It's a celebration of our time together! A joyful noise! Molly May, Dee Dee, Kilchis and I! I've had it happen, that my son David, with his window open, laughs out at me, "Will you cease?" Songs are simple, so we can all understand. It makes me happy, and through their waggly tails, as they glance up at me, I can tell they feel pretty good, too... Or else they are laughing at me! Sometimes I add other words they recognize that perk their ears, such as "treat" or "fishing!" or "cookie!" Happy words for happy times! I remember the English lady who trained dogs. You know, the Barbara Woodhouse shows. She always taught about pets and their reaction to voice inflection. Sing-song, high pitched, "Walkieeeeeee!' It works! My songs have simple words, sung to simple, sing-song tunes. Dee Dee is hard of hearing, and get's left behind, methodically digging for rats. Molly is absorbed in hiding in holes, and racing from one, to another. She thinks no one can see her stealthy cat tactics! Yeah, right! Kilchis is wild, and all over the place. He can run as fast as a dipper, and almost catches them! The water level is low now, so he's discovered he can plunge through the rapids at warp speed again. It's only in the river's middle, that the current stops his speed, and he is taken downstream a dozen feet or so. Any steelhead have got to be spooked from here and gone again, so I don't even bother bringing a rod on these "family trips!!" I die laughing, in the middle of the song though, as the river path ends and I turn. I call to them, so no one gets left behind. I walk by myself, at first, back to the house. Pretty soon, I hear the sound of galloping dog feet in the sand, and Kilchis zooms by me, spitting sand and water with every lunge! Then, the echo of equally fast, but much quieter gallop of cat feet. Zoom! There goes Molly! I swear that cat thinks she is a dog! I've never seen a cat chase a dog! She's just as fast as Kilchis, and catches up with him in no time! It's spooky, sometimes, because randomly, she will choose 'up my legs, and over my shoulders' as a route to where she is headed. That's when my song turns to an outright belly laugh. That cat is something else! Finally, I turn, and call once more, for Dee Dee. Poor Dee Dee! My son Andrew, has nick named her "Sea cow". She's a big, black, lumbering old lab who seems to laugh at everything, and I can see his point! But, Andrew! "Sea cow?" My song returns, "My Dee Dee... My Sweetie.... A cookie, for Dee Dee...." Her head rises from the flying dirt, and out of her rat trance. Cookie!? She's slow, but she's on her way! It's spring, and there is still a chill in the air. The sunlight on the river was warm, but as we approach the shaded, wet grasses of the meadow, I shiver. We all end up in the mud room. Off with my waders, off with my coat. A fire is set in the wood stove. I light it. Molly is treated to a fresh can of cat food. The dogs, the promised cookie. The hills are alive, with the sound of music! And it's a happy tune, on the Kilchis river... but it sure isn't Julie Andrews. My business partner asked me, "Can you believe that Ifish (post and thread totals) have increased by 50% in 4 months?" As I pick myself off the floor, and as I recall how my life has changed in that window of time, I say, "Yes. I believe it!" I'm left gasping for air. Rummaging through more than 300 e mails, I see the following. A response to my helping them with a login for Threads: "Thanks Jen, by the way how do you keep up with all this and fish as well?" Well, I'll get my fishing in, soon, but I've been lacking, of late. That's for sure! When Bill asks, I have to consider how my work will suffer. With the medical condition I deal with, presently, I can barely keep up. I can only work so many hours before I exhaust my opportunity to do anything but rest. Knowing this, I need to decide. "Do I expend my energy fishing, or working?" I'd choose fishing in a flash, if it weren't for what I'd come home to! If I just do the work, I'm OK, but if I go fishing, and come home to double duty, (stacked up backed e mails, and "to dos") I pay, big time! How to balance? Fishing/work/surgeries? It's a continuing battle of thinking, "OK! When I get over this mountain, I can fish!" However, as of late, I've been going through some very mountainous terrain! Hopefully, this last installation of threads was the last "mountain" for a while, and what lies ahead of me, an ocean blue, full of fish! YES! My schedule for the next 6 weekends is full. Full of exciting tournaments, fishing and spending time with wonderful, exciting fishing people! Tonight starts the STEP conference! Please attend! This is a great learning opportunity for everyone! April 3rd begins the Salmon Quest! I'll fish in Bill Monroe's boat with Bill Hedlund, and who knows who else? :) Surprise! We have auctions for seats in this tourney, right here on ifish! Check out the board! Who says you can't afford to go? Ifish is making it possible! April 10th is a weekend off of fishing, but filled with my son's first rock concert, my nieces wedding, and our annual family Easter Brunch. Look out for the fruit bunny, who always makes an appearance! April 17th, is the 17th Annual Hall of Fame Banquet and Auction . I'll be there! I always am, and I love this event! See you there! April 24th, I am fishing with the winners of the David Johnson Valentine's contest! All girls, all the time! I can't wait! Wow! May 1st I have off! To do what? Fish! But, May 7th, is the Kings for Kid's tourney, and the media boat flies again! It's Nick Amato, Bill Monroe, and Jennie, off to catch some fish, and some news! After that, I have assorted Sports shows, OWAA conferences, and a summer of fun with my kids. So, mountains of work, stay away! I need some flat lands, and flat water for a while to make it through! It'll be by the grace of God, that ifish will still be up and running! Get this! I've actually been enjoying life this weekend! Chris Sessions came over on Friday, and helped us to totally make over the laundry room! We put in brand new cabinets, and they are gorgeous! Thank you, and many thanks to Jeff Melburg, too! I don't understand why everyone wants to be a member of the "I want to be like Jeff" club. I mean, the guy catches lots of fish, yes, but... I'd much rather just be his friend! Yesterday, I spent the morning at the STEP conference, and I was pleased to listen to my favorite speaker, Jim Martin. He has a way of charging me up to do good things for the fishes. I get all filled with enthusiasm about it, and want to spread that energy around! He spoke about what to expect of our rivers and salmon in fifty years. Our climate is predicted to be that of what San Francisco's is, now. There will not be as much snow pack, and there will be more rain. Scary thought, isn't it? The ocean conditions now, are wonderful, and we are all hopping around thinking, "Isn't life grand?" The truth of what we have been doing, will be told when the ocean conditions turn around again. Will we have done any good? Will our efforts pay off? Jim set forth a challenge for all of us. Even those who are already involved in the STEP program. Even those who already pick up litter, or volunteer time in enhancement projects. The challenge is this: Are you teaching others about what you are doing? You haven't finished your job, while volunteering time in a fisheries effort, if you haven't contacted the media about it. This hit me more than once. It hit me that ifish is more and more a chat line, and less and less a powerful, united force that affects positive change on our fisheries. It is my aim, and renewed effort to make my best attempt to change that. Secondly, when I attend conferences, or volunteer my time, I am going to share it with not only ifish, but with the local paper of where the event is happening. These kinds of efforts hold everyone's attention. No matter fisher, or not, nearly everyone in Oregon is proud of our fish. Those big, broad shouldered salmon that run in our rivers and streams are our heritage, and the pride of our green and gorgeous state. Next time you volunteer, please, share the news with all of us! We care, and we are proud of not only your efforts, but the change you are working for, so that in fifty years, our children might be blessed with the salmon that we are blessed with, presently. Ocean conditions favorable, or not. I have to hurry, because Bill will be here soon, and wants to go up the Kilchis for the last day of the season. Yikes! Is it that time already? Seems like it's just about the saddest time of the year around here. The river closes up, and I wring my hands until it opens again the fourth Saturday of May. I feel so backwards. Many people see Fall as the time when everything dies. To me, that's when the world comes alive. Salmon come up the rivers and everything explodes into life! Funny how Kilchis, my dog, is so in tune to what clothes I wear. I get up in the morning, wearing pajamas. He knows it's time to go outside. He's excited! Then, I answer some e mails for a while, and have coffee. He snoozes by my side. The minute I rise from the chair, his ears perk up! Yes! She is going for the garage! Yes! Waders! He nips at the straps! His barking will not cease! FISHING! YES! He's a mass of wagging tail and flying fur. Out the door we go! RIVER! Today, I managed to land a beautiful 10 pound wild buck on a First Cast Cerise and pink tail flasher jig. Third cast, bobber down! I knew I'd catch today. I had the attitude. "Expect a fish with every cast." I really do find that if you don't get a fish in the first three casts, the easy ones just aren't there, and I move on. This time, I was lucky! Kilchis and I headed indoors for a while. He sat on my bed, while I shower. What will she wear next? Garden clothes? Cleaning clothes? Jeans? What? "Oh nooooo." I almost hear him say. "She's getting out her high heels and black skirt. This is not good." I kid you not. His ears droop. He slinks. He knows that I am leaving. He knows he cannot go with me. As I head for the door in these clothes, to go to a meeting, he doesn't even get up from the couch. He's sulking. Mom's in a dress. This is no good. When I come home, though, all is forgiven, and we wait for the next set of clothes. "Come on, Kilchis! Let's go!" We go get the waders, and he nips at the straps, and it's replay, all over again. So far, today, I have been in all four get ups. I just came home from a meeting, and now it's time to head upriver, to fish. I think it would be fun sometime to put on one boot, and one high heel. Wonder what he'd do? This time, he's coming with me, up river. Sometimes I leave him home. Today? I just can't. He's far too happy after being left home. "Come on, Kilchis! Let's go fishing!"